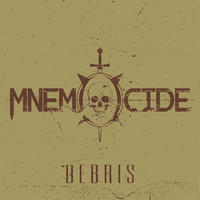 Formed in 2017 and built to destroy, MNEMOCIDE debuted this year with their first four-track EP, “Debris.” When it comes down to the point, the material presented on this EP is nothing special or new. It isn’t original as much as it is a combination of different inspirations. However, that doesn’t mean it’s worthless. What is on this EP may be unoriginal, but it’s executed much better than I expected it to be. When it comes to modern Death Metal acts, I usually steer away. However, I sometimes find modern brutal Death Metal acts that I enjoy such as ABORTED or ABYSMAL TORMENT. While both of those band debuted in the early to mid-2000s, their later albums all have a lot of modern influence. This same sound is oftentimes found on MNEMOCIDE’s EP. There are moments on “Soul Collector” and “Only Shades” that remind me of the latest output from ABYSMAL TORMENT and the second half of ABORTED’s discography. While MNEMOCIDE may not be a Brutal Death Metal band, this sound is very noticeable, especially to a connoisseur of Brutal Death Metal such as myself. MNEMOCIDE is a lot more Death Metal than Brutal Death Metal. They’re like CANNIBAL CORPSE or AVULSED in that they aren’t quite Brutal Death Metal, but they’re pretty close. Like I said, I was quite surprised when I heard the material on this EP. The riff-age on here is not brilliant or mind-blowing, but it’s straight forward and heavy enough to mosh to, and that’s what matters. The production, while not perfect, is enough to fulfill its part in the music by making everything sound heavier. Not only that, but the atmosphere and flow that this EP sometimes possesses is extremely strong and shows large amounts of potential (one specific example of this is around 2:09 and again around 2:44 of “Only Shades”). This EP is very promising. MNEMOCIDE, if they harness the strong points of what they already have and run with them, can become a really heavy band. I would definitely listen to their material sometime in the future.